Flash Flood Guidance is an estimate of the amount of rainfall required over a given area during a given duration to cause small streams to flood. These estimates are based on the current soil moisture and stream flow conditions for the area. 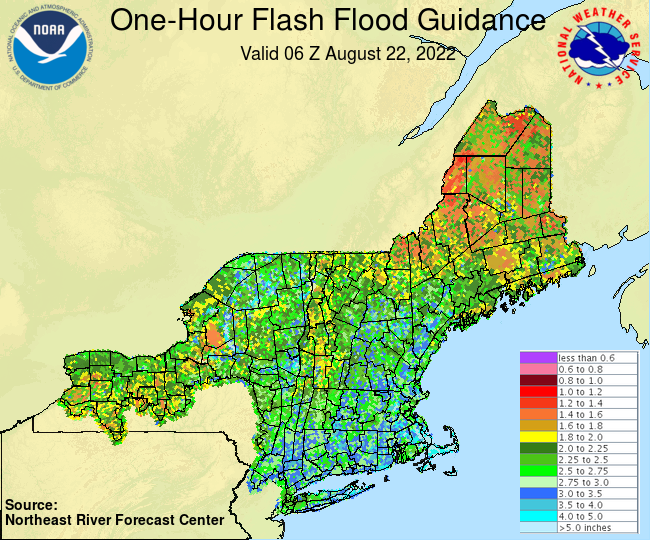 Flash Flood Guidance is routinely issued by National Weather Service (NWS) River Forecast Centers, and is used by NWS Weather Forecast Offices when issuing Flash Flood Watches and Warnings to the public. Note: Less rainfall is required to produce flash flooding in urban areas. The Flash Flood Guidance Text Products (BOSFFGMA, BOSFFGME and BOSFFGNY) were discontinued on April 1, 2019.